The first violin part for the Overture from Nicolai's Merry Wives of Windsor has been edited by Steven Staryk, renowned musician who has held the concertmaster position with some of the top orchestras in the world, including the Royal Philharmonic Orchestra at the age of 24 (the youngest ever), and earned the title "king of concertmasters" from The Strad magazine. Staryk's bowings, fingerings and other editorial markings have been added throughout the score. Nicolai's The Merry Wives of Windsor (Die lustigen Weiber von Windsor) is an opera in three acts to a German libretto by Hermann Salomon Mosenthal, based on the play of the same name by William Shakespeare. The first performance was at the Hofoper in Berlin on 9 March 1849. The opera is a Singspiel, containing much spoken dialogue between distinct musical numbers. The opera remains popular in Germany, and the overture is sometimes heard in concert in other countries. 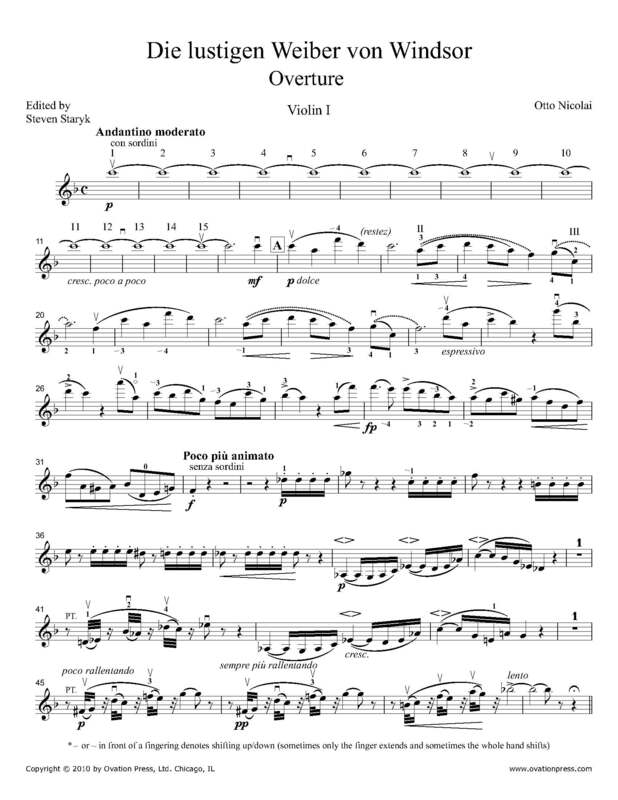 Download and print the score today to gain access to expertly edited Nicolai Merry Wives of Windsor violin fingerings and bowings from Steven Staryk!